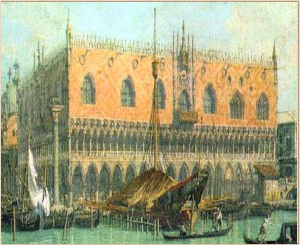 The Palazzo Ducale, or Doge’s Palace, was the seat of the government of Venice for centuries. As well as being the home of the Doge (the elected ruler of Venice) it was the venue for its law courts, its civil administration and bureaucracy and — until its relocation across the Bridge of Sighs — the city jail. The system of elected doges was as singular as everything else about this very singular city, and lasted for 1000 years, from the election of Paolo Lucio Anafesto in 697AD to the deposing of Ludovico Nanin in 1789. The Serene Republic was just that, a republic, and guarded fiercely against hereditary rule, though as we will see that principle was increasingly shaped to the advantage of the ruling classes. A vast bureaucracy of elected civil servants, committees and councils was presided over by the only figure elected for life, the doge.